$49.00 This item is selling for $49.00 on eBay. 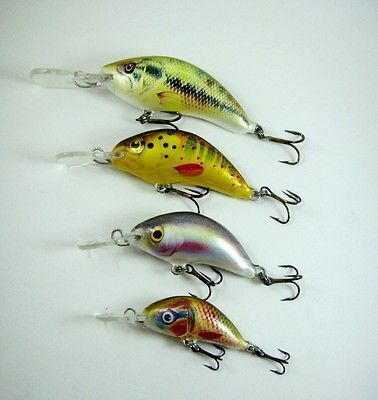 Ugly Duckling Fishing Lures- model S - balsa wood hand made lure size 2 / sinking / DOR color size 3 / sinking / YE color size 4 / sinking / GOLD BT COLOR size 5 /sinking / BASS color Hand made,tank tested, manually tuned this small sized lure are very adaptable for various conditions. Don't be fooled by the Ugly Duckling size. It is great for big perch , bluegill, trout, crappie and bream. Yet it is also extremely effective when bass are feeding on small baitfish. It is fast tight action attracts all predators. This great bait is designed to catch big panfish and big bass as well. Made from 100% balsa wood the lightest and liveliest material for a fishing lure. Comes with premium black nickel VMC round bend hooks. Each lure is tank tested to perfection before it goes in the package. Model Type Length Weight Swimming depth Treble hooks Recommended line diameter inches cm ounces grams feet meters inches mm 2S Sinking 1 2.5 1/14 2 1-3 0.3-1 No.16 0.005-0.006 0.14-0.16 3S Sinking 1 1/4 3.3 1/10 3 1-5 0.3-1.5 No.12 0.005-0.007 0.14-0.18 4S Sinking 1 5/4 4 1/7 4 1-6 0.3-2 No.10 0.006-0.008 0.16-0.20 5S Sinking 2 5 1/5 5.5 1-8 0.3-2.5 No.8 0.006-0.009 0.16-0.22 About Ugly Duckling Brand For thirty years, Ugly Duckling company has been dedicated to producing high-quality balsa fishing lures. The story began in the late 60's when talented fishermen enriched his fishing passion by creating lures that suited his favorite rivers best. A family fishermen heritage helped him to develop an eye for studying nature and fish behavior. After many years of fishing experience all over the world he developed a line of originally designed lures and lure production technology. Today, after endless tank and stream testing and laboratory research Ugly Duckling Lures are proud to recommend you each and every lure our team of craftsmen have manufactured. Ugly Duckling lures are made of first grade balsa. Originally developed protective coatings and structural design provide considerable durability. Ugly Duckling lures have already reached customers worldwide (selling in over 30 countries) Ugly Duckling 2-5 Sinking Why so small? Cast it when all else fails. Before you pack your gear, rub your frozen hands together and try again. If you know where they are, wobble it in front of their eyes! You’ll see that they can hardly resist. And when you get a strong bite on size 2 ... well. it is not unusual to be taken by surprise. A palette of size 2 through 5 let’s you search the water for finicky fish. While small, they still retain all the basic features one can ask for. Intensive vibration, diving depth and weight required for long and accurate casting. These lures sink slowly to stay long enough in the sight of predator and allow you to control the depth of your retrieve. They dive deep when you hold the tip of your rod near the water surface. However, they respond quickly to changes. Therefore the diving depths of our lures are widely specified. Sensitive to your rod-tip position, they will follow your actions and inevitably give your the prestige and satisfaction of success. What else? Yes - they are designed for solid hooksets and secure landing. Two VMC trebles will make all your worries go away. Anywhere, anytime, any predatory fish. Keep some in your pocket for those unexpected occasions and rivers you encounter for the very first time.